These carvings look as if they're reaching from beyond the grave. Step 1: Select a pair of pumpkins to form each arm-hand combo. Determine which gourd will serve as the arm (usually the taller one) and trim its stem so the other pumpkin can rest securely on top. Carve a hole in the bottoms of both, scoop out the pulp and return the cut pieces. 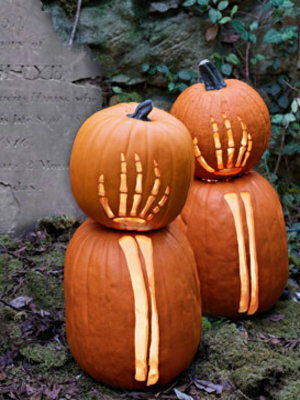 Step 2: Print out a picture of a skeleton hand and arm, scaling the images to fit your pumpkins. Step 3: Cut out your new stencils and affix to the bottom pumpkin with masking tape. Trace on the design with a felt-tip pen. Repeat the process on the other pumpkin, using the hand template. Step 4: Remove stencils, then carefully carve along the drawn lines with an X-Acto knife. Affix a battery-operated votive candle in the base of each pumpkin with adhesive putty, then stack. Repeat to create a graveyard effect. Savannah stylist Liz Demos skipped the carving knife and went straight for a paintbrush to fashion these graphic pumpkins. "With a stark black-and-white palette," Demos says of her trio of bold designs, "you can make any pattern, even creepy insects, look downright chic." 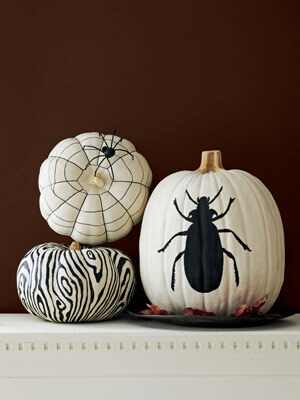 For each of these creepy crawly black-and-white designs, start by brushing the entire pumpkin with a coat of white flat acrylic craft paint and let dry for 20 minutes. To create these patterns or your own, use a black fine-tip paint pen for small details and black flat acrylic craft paint for larger designs. Then, let the pumpkins dry for 30 minutes. 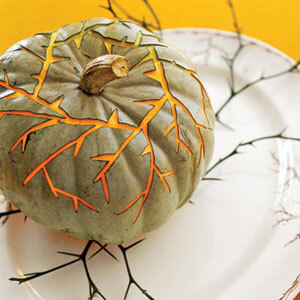 For added elegance, pick your pumpkin's theme from a china pattern. The thorny vines on this antique transferware platter (as well as the real thing!) suggested the delicate design on this 'Blue Hubbard. A passel of pumpkins provides the backdrop for a quaint village scene. Step 1: Carve a hole in the bottom of each pumpkin, scoop out the pulp, and return the cut pieces. 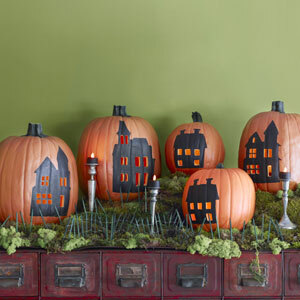 Step 2: Draw or trace house designs onto the pumpkins with a felt-tip pen. Step 3: Then carefully carve along the drawn lines of the houses' windows with an X-Acto knife. Fill in the designs using a fine-tip brush and black flat acrylic paint; let dry. 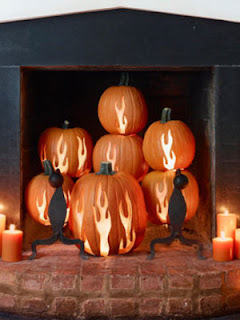 Affix a battery-operated votive candle in the base of each pumpkin with adhesive putty. 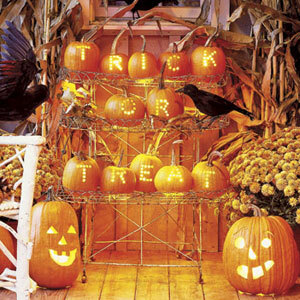 Spell out your greeting in mini pumpkins gathered at a prominent -- and stationary -- location. First, pencil letters on hollowed pumpkins (carve out the opening from the bottom). Then, using a drill with a half-inch bit, bore holes to form each letter. Here, strings of Christmas-tree lights, gathered in small bunches, illuminate each pumpkin (unscrew bulbs where the string descends to the next row). Set your hearth ablaze with these rip-roaring flames. Step 1: Begin by experimenting with the placement of pumpkins in your fireplace. Once you're satisfied with the arrangement, trim any stems that interfere with stacking stability, then determine how many flames each gourd should get. (Use this photo as a guide.) Note where each pumpkin goes and dismantle the arrangement. Step 2: Carve a hole in the bottom of each pumpkin, scoop out the pulp, and return the cut pieces. Step 3: Draw flame shapes on pumpkins with a felt-tip pen, then carefully carve along the drawn lines with an X-Acto knife. 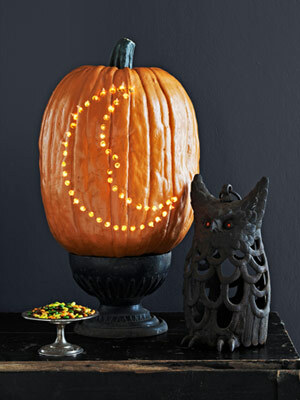 Affix a battery-operated votive candle in the base of each pumpkin with adhesive putty. Finish by restoring your arrangement. Paul Lowe, a New York City stylist, found inspiration in a classic toy for his celestial creation: "I wanted to mimic the look of a Lite-Brite, so I punched holes to create a simple crescent moon-shaped image, then added a string of tiny bulbs to make it glow," he says. Step 2: Draw the moon shape onto a piece of paper, using this picture as a guide. Then, center the image on the pumpkin and affix with masking tape. Step 3: With an awl, punch the outline of the design through the pumpkin's flesh. Step 4: Remove the paper and fit each hole with a bulb from a set of battery-powered string lights. Step 5: If you've removed the pumpkin's top, fit it back into place. A sturdy bookcase provides the structure needed for this painted-tree idea to take root. Step 3: Working one shelf at a time, remove the pumpkins and fill in your outlines with a fine-tip brush and black flat acrylic paint. 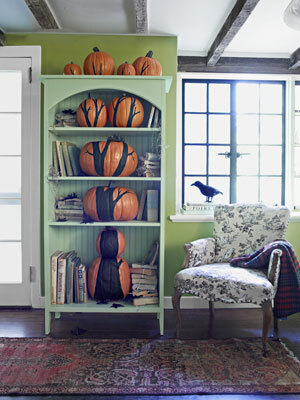 Let dry and replace pumpkins in your bookcase. New York City stylist Marissa Corwin put a cheeky spin on the very word jack-o'-lantern with her three glowing silhouettes of old-school lamps. "They're a bit more sophisticated than your average spooky face -- something adults can appreciate, too," she says. 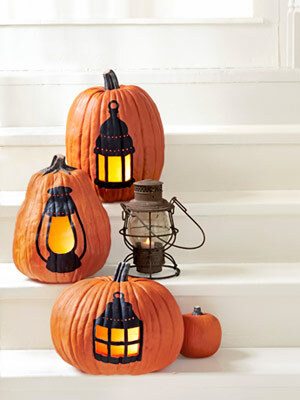 Step 2: Print out a picture of a lantern and resize it on a copier, scaling the image to fit your pumpkin. Step 3: Cut out the shape on your template and center it on the pumpkin, affixing it with masking tape. Outline the shape of the stencil onto the pumpkin with a fine-point Sharpie. Step 4: With the stencil still affixed to the pumpkin, use an awl to punch a line through the top portion of the lantern. Step 5: Remove the stencil and carve out the pane(s) of the lantern, following the lines you drew. Step 6: Then carefully fill in the design using a fine-tip brush and black flat acrylic craft paint, and let dry. Step 7: Light the pumpkin with a two-by-three-inch battery-operated votive candle. If you've removed the pumpkin's top, fit it back into place. 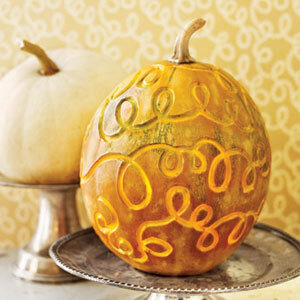 Achieve enchanting effects by scoring the skin of a pumpkin with motifs taken from your home's décor. The curlicues here were inspired by the "Vermicelli" wallpaper from Farrow & Ball on the dining room walls. The flesh was scooped out from an opening cut in the bottom, then the motif was inscribed with a linoleum cutter.